We have decided to mix it up a bit and we thought we would go and look for the Butterflies. Instead of sailing the blue highway, we would take a trip to the Hippie Trail for a short hike and then visit a few watering holes for swims to recover. We are going to take a gulet trip. 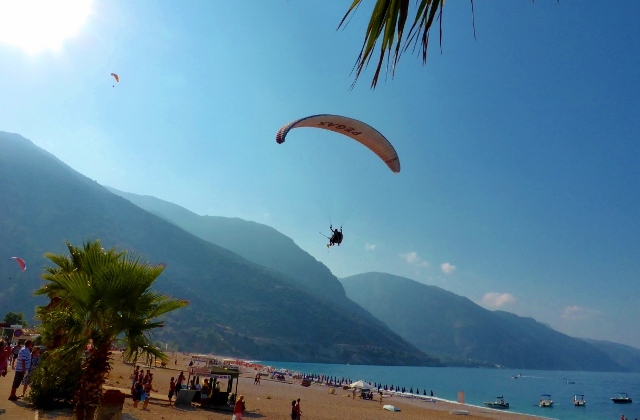 One of the captains collects us from Ece Marina and we take a scenic drive over the headland from Fethiye to Oludeniz, a beautiful seaside resort famous for its swarms of paragliders. 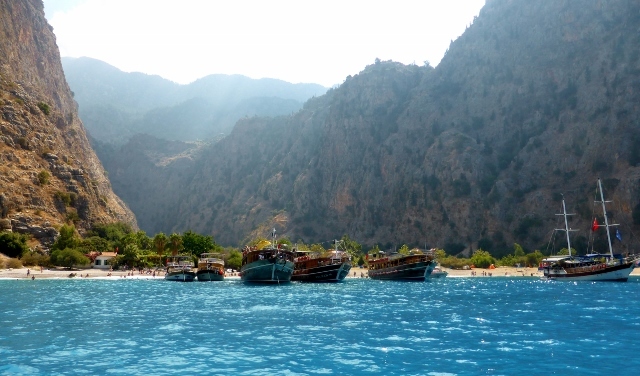 Oludeniz is known for being one of Turkey’s most photographed beaches. It seems a bit surreal to see so many paragliders in one place, all jumping from Babadag Mountain, many are tourists, so they are in tandem with the ever present go pro’s in their hands to record their flights. 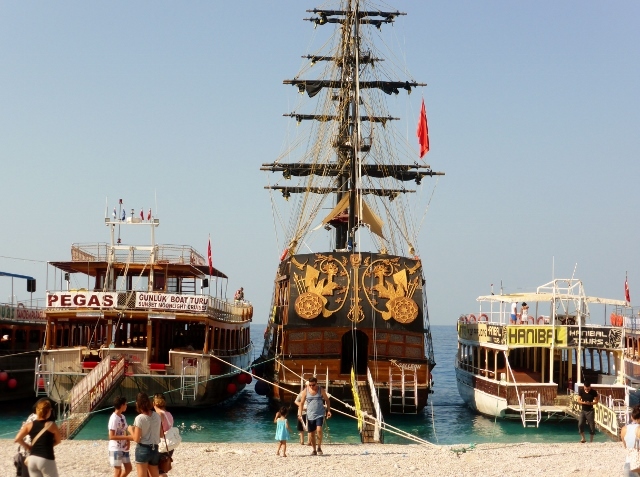 The beach is a hive of activity, with hundreds of people coming to find their gulet on the shore and make the jump onto the passerelle between waves. There are several types of gulets, these are the daytripper style with two levels, a covered level below with tables and the roof covered in floor to floor beach bags for tanning purposes. 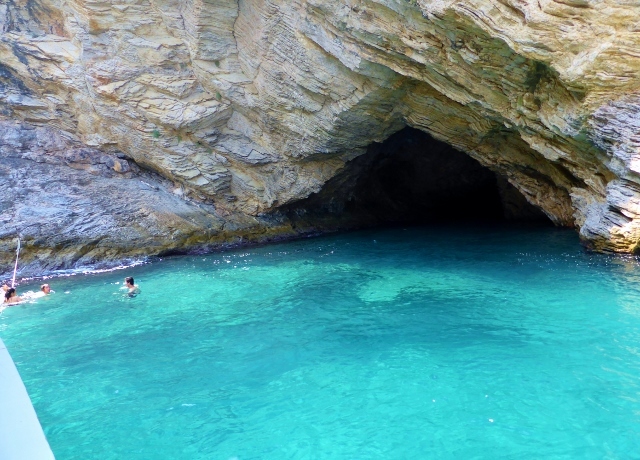 It is a warm morning, so our first stop is at secluded Blue Cave beach. At least it was secluded upon arrival. About 15 minutes into our stay, Ninja Gulet shoved between us and the wall you can see above, almost taking a few of our fellow passengers with him. The Ninja’s Captain shouted at us and then took his gulet and motored away. There is a universal truth that if one gulet comes others aren’t far behind. Seclusion may be overrated. 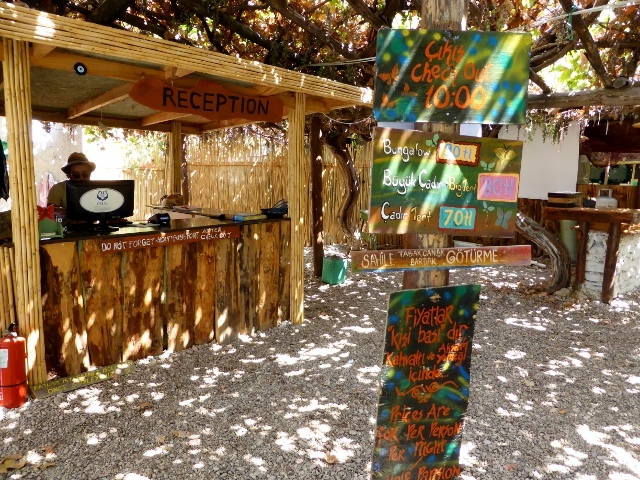 Butterfly Valley is a no road access beach, gorge and butterfly sanctuary. There are acres of plants here that they love, interspersed with tents and an open air restaurant on the beach. 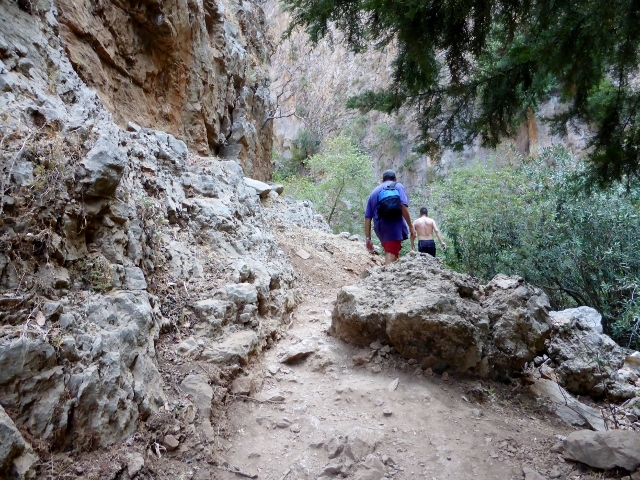 We decide to hike up into the gorge, which reminded us of our last hike with Peggy S and Donna in Tucson. Butterfly Valley isn’t as big an area but there were no tour guides warning us about mountain lions. 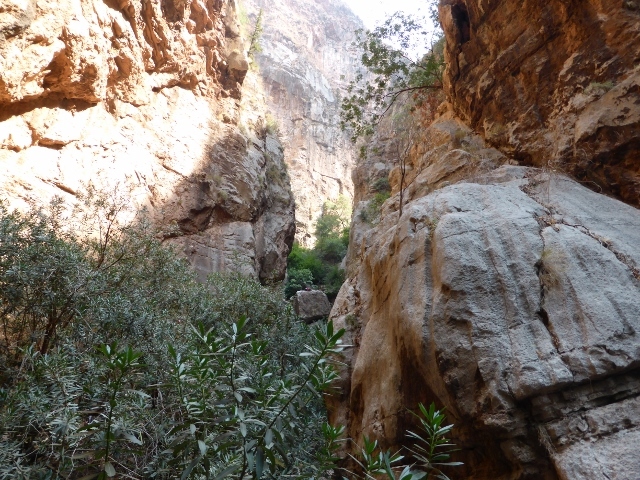 The valley gorge is quite wild and beautiful, no butterflies to be found as we are probably out of season. We aren’t sure about the tent city but the reception was quite colorful. Hotel California in Butterfly Valley, I am not sure of the name but that song kept playing in my head on the way home. Happy Birthday Rachel Hayes. 30 has never looked so good.